The colors used are white and silver. HTC does not work with half measures and because of that on HTC Radar they used only quality materials. There is nothing that creaks. The metal case gives the impression of solidity but it do not raises the thickness. It stands out the dedicated camera button which is distinct stylized from the other controls. It doesn’t provide access to the battery. The battery cover is small. HTC Radar points out especially among the female audience with a lot of white and silver. Its edges are rounded giving a good grip when handheld. It brings a 3.8-inch S-LCD -a slightly atypical diagonal – with a resolution of 480 x 800 pixels and 16 million colors. You can compare with the AMOLED from Nokia Lumia 800 and you will notice that the major difference is the black color and the color intensity -the colors are stronger on AMOLED. Accumulates fingerprints easily and does not hurt to have some wet wipes designed primarily remove them from time to time. At its base you will notice three capacitive buttons with the role of Back, Home and Search via bing. The sound is provided by a tiny speaker located on the back of the phone next to the 5 megapixel camera sensor. The sounds is strong and clear. The 3.5 mm jack is located on the lateral and it integrates the SRS Sound technology. Microsoft has chosen to have a strong hardware on its mobile with Windows Phone. HTC has complied but the HTC Radar phone is kind of minimum in this area. It brings a processor clocked at 1 GHz, 512 MB RAM and 8 GB of storage without a slot for microSD cards. It runs the native Windows Phone 7.5 or Mango. 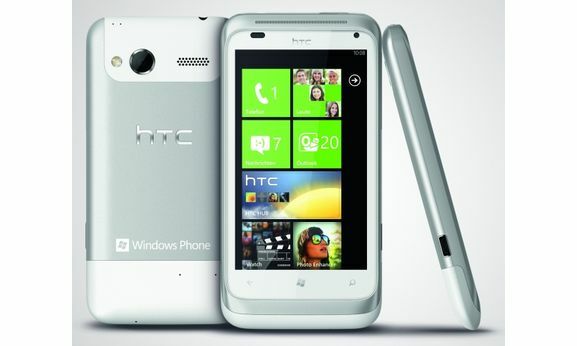 The experience provided by this phone is at the same level as HTC Titan or Nokia Lumia 800, but you will see, for example in browsing that has a weaker processor than the 1.5 GHz on Titan or the 1.4 GHz on Lumia 800. The differences are minimal. On the upper side you will find the 3.5 mm jack and the start / stop button and also the lock and unlock the touch display button. On the right side you will notice the generously sized buttons for volume control and also the button for the 5-megapixel camera. The microUSB port is positioned on the left side. It bring 3G with a download speed up to 14.4 Mbps to Wi-Fi b / g / n, Bluetooth 2.1, DLNA. The connection via wi-fi is ok but as the HTC Titan it doesn’t has a large range.